When you think of Europe you think of Mediterranean beaches and warm waters, even the UK has some of the most stunning coastlines and the best beaches in Kent. But it is the Algarve that has some breathtaking beaches to visit when looking for beaches near Lagos Portugal. The Algarve is located along the southern most point of Portugal and spans from Lagos to Sagres with several beach along the way. To get to Lagos you can take a bus from Lisbon. The bus takes about four and a half hours and costs less than €25. Make sure you are heading to Lagos not Lagoa! 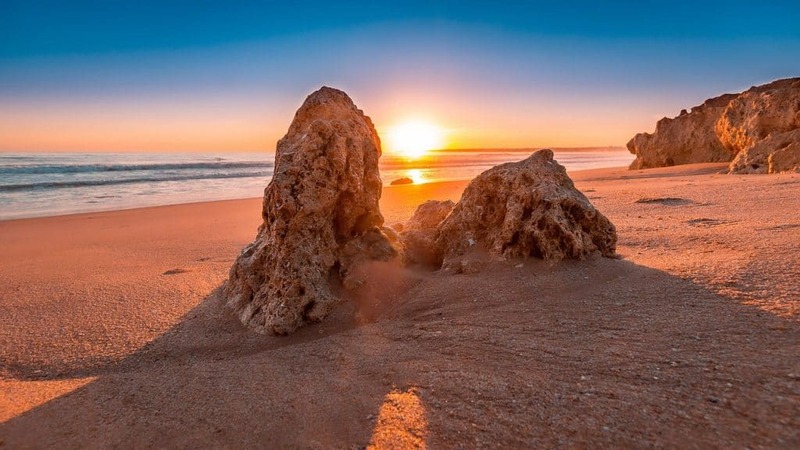 The other great thing about the beaches in Lagos Portugal is that the area boasts 300 days of sunshine a year perfect for extending your summer holidays into September or October which is the shoulder season and not as packed as the middle of summer. The first time I went to the Algarve was October 2002. 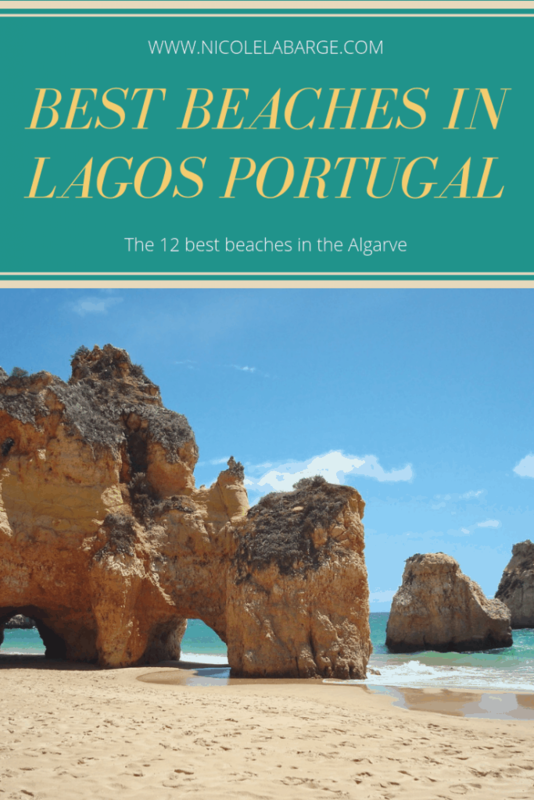 You really cannot go wrong with any of the beaches in the Algarve as this is where to find the best beaches in Lagos Portugal. I’ve put together a list of my favourite beaches and some practical information you will need if you want to visit. Even though the name of this beach translates to Student Beach it is not for students only. This beach has a cave system and archways that are worth seeing. You can also visit the next beach by going through the tunnels. Praia dos Estudantes is often overcrowded but worth a stop to see the cliffs, caves and tunnels. There is also a bridge built to an inlet for a great viewpoint. In 2013, Conde Naste Traveller named Praia Dona Ana the best beach in the world. Call me crazy, but I don’t agree with this title at all and I’ve named my favourite beach last on the list. This beach is located in Lagos which makes it handy if you do not want to drive to the beach. This is a sandy beach and it is best for its flat beach and handy access. This beach does have services such as kiosks, car park and a walkway down to the beach with sun chairs to spend your day. I would say Praia Dona Ana is a more active beach with paddle boarders and kayaks and boats in the water near by. This beach is hugely popular with the tourists and has the same limestone cliffs the area is known for along with rocky formations and beautiful azure waters. 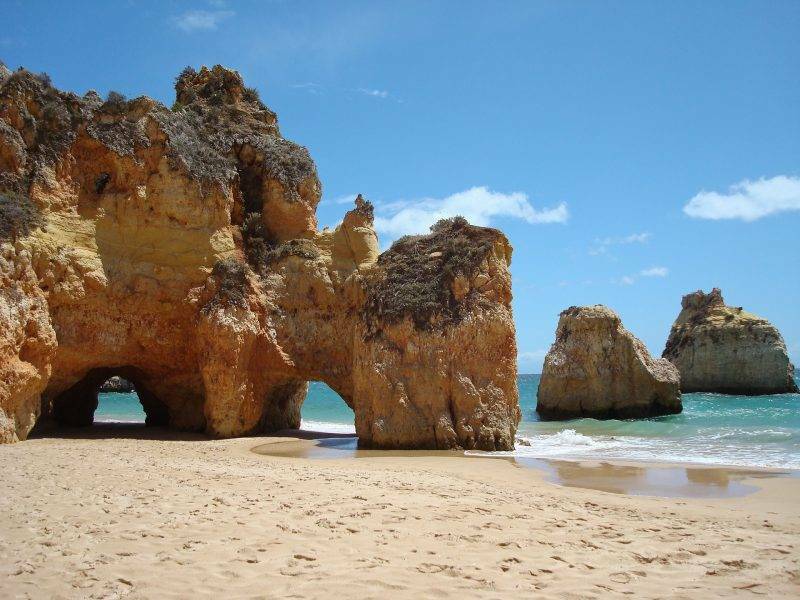 Located right next to Praia Dona Ana, Praia do Comilo is another popular beach right in Lagos. Here you will find the views you have come for in the Algarve. The access is easy to get to the beach but there is only one restaurant near the entrance so you will need to bring your own drinks and refreshments for a day at the beach. Praia da Balanca is a small beach in a rocky bay on the Golden Coast close to the Ponta de Piedade in Lagos. It is probably the hardest beach to get down to but worth the effort. There are amazing views of the stand alone cliffs. This beach tends to get overcrowded as it is a small beach but worth a stop. Praia da Figueira is a huge beach. It is a quarter mile walk from the road across the beach to the ocean. The city has put many boardwalks, bars and showers all along the beachfront so it is well accessed with facilities. The beach is surrounded by cliffs and if you go for a walk to the east you will see 16th-century ruins. This is one of the least visited beaches in the Algarve because of the walk but do not let that deter you as it is a beautiful, quiet beach. Praia do Zavial is located in the mouth of a river where the Atlantic meets the warm Mediterranean. This is another well kept secret of a beach in the Algarve as it is not one of the most popular ones but is definitely worth your time. There are a few trails you can hike in this area if you don’t want to sit and sun bath all day. I recommend hiking around as it is a big area and you might find a spot along the beach that is a bit quieter and calmer and more to your liking. Praia do Tonel is a nice place to visit and has a great surf. Its quite packed in the water and drinks are expensive here. This beach is located closer to Sagres on the western side and surrounded by giant cliffs. Praia do Beliche is a great beach for surfing. And because it is sheltered from the harsh winds it is also a great place for sunbathing. Again closer to Sagres than Lagos it is a great beach to spend the day at and watch the sun set. These beaches are about an hour east of Lagos but they are two of my favourite beach and well worth the drive. In my opinion these two are top of the list of beaches to visit in the Algarve. Right next to Praia da Marinha and the Benagil Caves is Praia do Carvalho. It is a beautiful beach that is popular for cliff jumping and there is a trail that leads to through a series of cliffs to watch. There are beautiful views of the entire coastline from the cliffs on Praia do Carvalho. Definitely worth the hike for those views. This award winning beach is featured in many guidebooks and for good reason. This is probably the best beach in all of the Algarve and is about one hour away from Lagos. This picture perfect beach is only accessible by a steep walkway down to the beach but that’s ok, it will allow you to stop and admire the views! This beach has the bluest waters and against the limestone cliffs and sand beach it is everything you want from a beach in the Algarve. The other main attraction at this beach is the Benagil Caves which you can kayak to from Marinha. Its a popular activity made even more popular by the photos on Instagram and well worth the trip in my opinion. 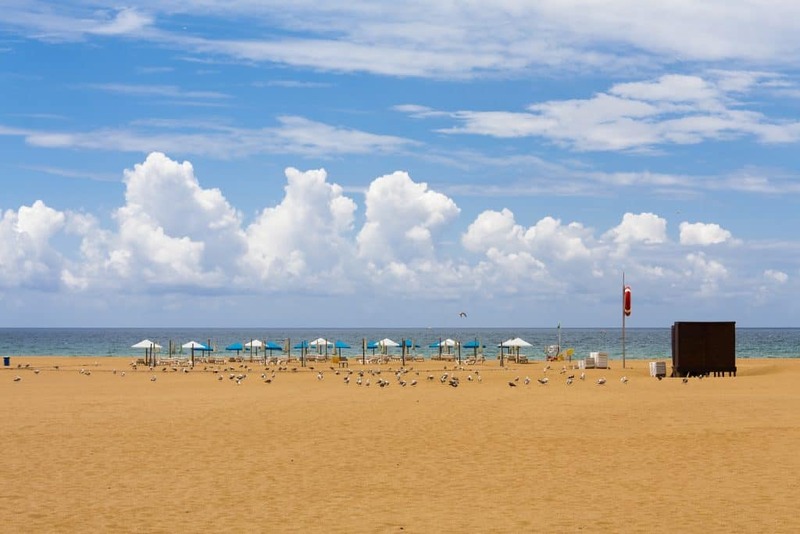 Beaches in Algarve – Which is the best Lagos beach? 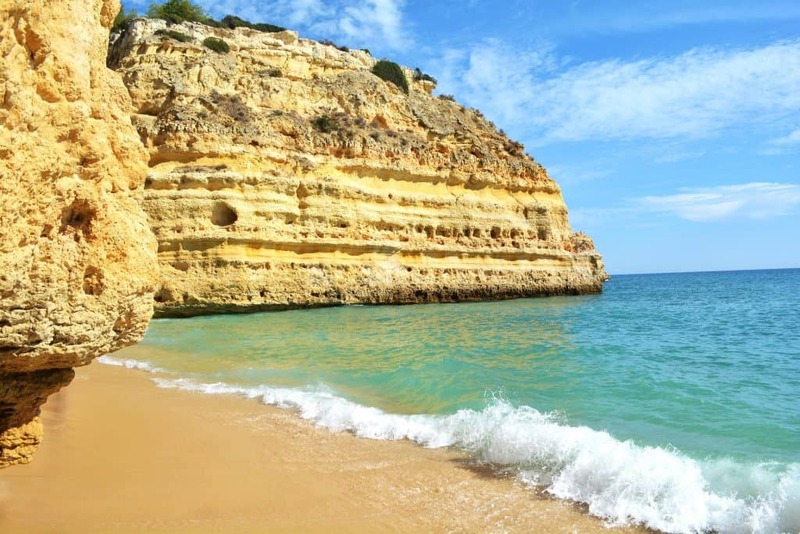 So Praia da Marinha is hands down the winner for the best beach in Lagos Portugal but there are a few other beaches in the Algarve I would like to mention. 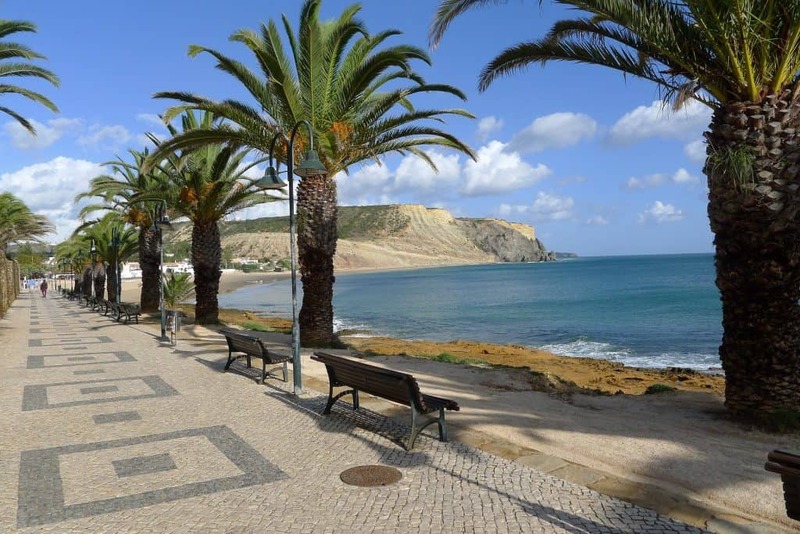 Its also worth noting Meia Praia as it is dotted with snack bars and restaurants, making it an ideal choice for those of you who enjoy long, sandy walks, while the absence of rocks under feet. I would also mention Mos Praia as it is the second largest beach in Lagos and it is quite wide and long meaning it is a good beach to visit with plenty of space. It is a golden sand beach and far less crowed that Meia Praia. 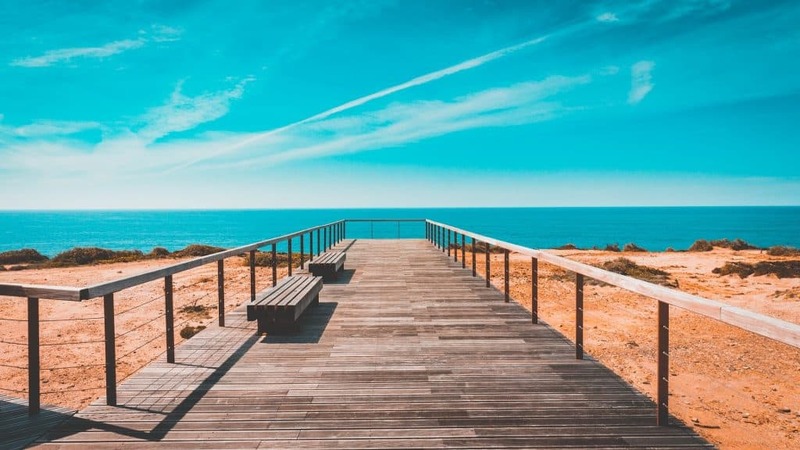 If lying on beautiful beaches get old after awhile I’d like to suggest the following activities for things to do in the Algarve. There is so much more to this country especially if you want to experience Portugal With kids. One of the most interesting things I did in the Algarve is take a boat tour to the famous Benagil Cave. 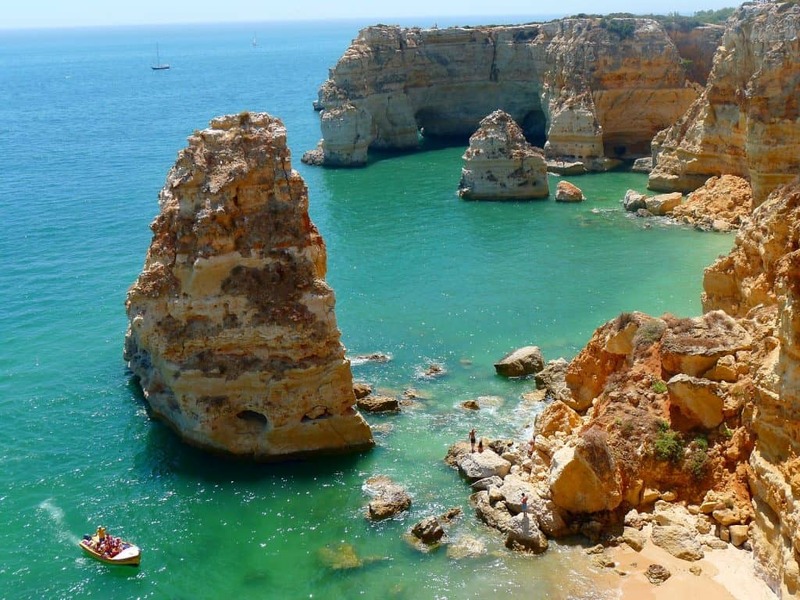 This 2-3 hour tour takes you along the Algarve coast to see the caves along the way. I won’t talk about how cool this place is here as you can go check out the post. It was a definite highlight to my time in the Algarve. You can take a boat ride from Faro for two hours in search of spinner dolphins. This can also be included in the Benagil Boat Tours. You just need to ask if this is an activity. Near Lagoa is a fortified enclosure that dates back to the 8th century before the Moors arrived in Portugal. It is an impressive fort overlooking the water. There are several golf courses and water parks in the Algarve that you can visit for a day of fun. At Cape St Vincent in Sagres you’ll be standing at the southwestern most point in Europe. It is famous for its lighthouse and stunning views. There are so many beautiful hotels along the Algarve with great views of the coast. One of my favourite hotels for its location and its rooftop pool is Hotel Eva in Faro. I would also recommend Hotel Vila Gale Lagos. This hotel is sleek, modern, and clean and prime location in Lagos. Sharing is caring. Feel free to pin this image to save for later. 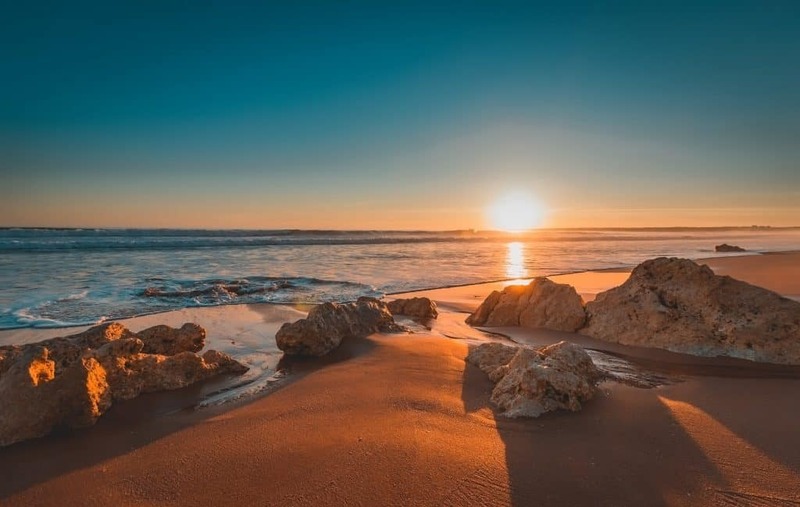 You captured some truly beautiful pictures of those Portugese beaches, especially that sunset! I think Portugal deserve much more than just city hopping. Definitely agree. Its more than Lisbon and Sintra. Beautiful photos! Benagil Cave is now on my bucket list! It is amazing and should be on everyone’s bucketlist. Looks amazing! I haven’t been to Portugal yet but we are planning to move to Spain in a couple of years, so we will definitely make it a priority to explore. we did a short holiday to Portugal over 15 years ago and hope to go there in our camper next year. Although we weren’t overly impressed – I would rethink that perspective having seen your pictures, which are amazing. Thank you. Thank you. I’m hoping to go again next summer. Your pictures are making me want to jump on a plane and fly to Portugal right now! great list, they look incredible! Thanks! Me too. Its such an amazing place. Portugal is a country I really want to visit. I so appreciate this post and the pros and cons of each beach. I’d definitely want to go to Praia da Figueira and walk to the ruins and check out Praia do Zavial, as I love the look of it. Also, the Benagil Cave Tour sounds super cool! Love the photo you included! Sea caves, cliff jumping, and surfing. Sign me up for a little Portugal. My surfing buddy spent about a month living and surfing in Portugal and he said it was off the charts. The pictures for the sea caves and sunset are phenomenal. The beaches of Lagos are stunning, aren’t they? So many different styles to meet the needs of anyone visiting. I’ve seen IG photos of the Benagil Cave, but probably none so beautiful as yours! I’ve never been to Portugal, and I admit, I hadn’t thought it was famous for beaches, but I learned better today. Wow what a beautiful destination! Wish I had read this before visiting Portugal last year, will put it on the list on the way back! Stunning photos! Benagil Cave catch my attention. I am always amazed how every Portugal beach post reminds me so SoCal. The Bengali Cave looks a lot like the sea cave near Sunset Cliffs in San Diego. So much so, I had to do a double take. Portugal seems like a truly remarkable beach destination. I fell in love with Comporto and Caiscais up near Lisbon and can’t wait to return to Portugal. Your post is super helpful with helping me choose which beaches in Lagos I want to explore. The cliffs near Praia de Carvalho are calling my name! The photos are stunning! The subject is also totally breath-taking which helps. 300 days of sunshine means a lot of beach time. Good to know what time the shoulder seasons are, that’s always our favorite time to visit and avoid the crowds. The sand and the water looks so inviting! Thanks for including driving maps so we know where to go and how to get there. Thanks for sharing. I cancelled a trip to Algarve last fall. Now I regret it. Just placed the Benagil Cave Boat Tour in my bucket list! 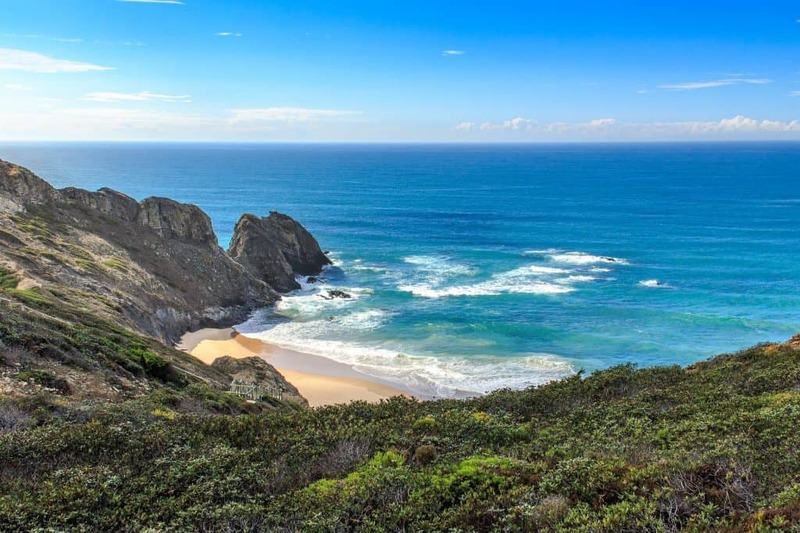 Great guide to the beaches of Portugal. I fell in love with them just by looking at your pictures. 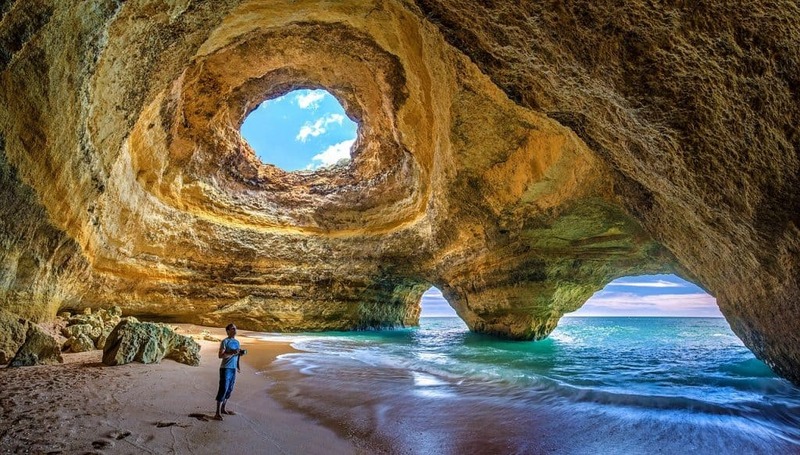 We are planning a trip to Portugal in summer, so I’ll make it a point to visit at least a couple of these spectacular beaches. From all I can see, a boat tour to Benagil Cave is an absolute must. I just came back from a trip to Lagos and I loved it! It was January so a bit cold for swimming but it was still sunny! I walked down to the Ponte da Piedade and stopped off at Praia do Comilo on the way, it was lovely! Benagil was definitely a highlight though! I am planning my trip to the south of Spain and Portugal and now I have found this super helpful post. I had no idea that there are so many wonderful beaches in the Lagos area. Can’t wait to check them all by myself. I hope the tours to Benagil Cave won’t be crowded when I am there. Looking at your photo of Benagil Cave, it seems like you have it all for yourself. So cool! Your photos look like paintings, they’re so perfect! Especially Praia do Comilo. I can’t believe that Praia do Zavial is not one of the more popular beaches with how picturesque it is! Clearly I need a beach vacation in Portugal. And imagine the whole tour is amazing. Long since I have been to a beach and this post is kind of teasing me. I am dreaming of Benagil Cave Boat Tour! I would love to go dolphin watching too.